Over 1900 pages of Jackson County, Missouri history including more than 1350 family biographies plus 54 Jackson County, Missouri communities on 5 different maps plus 1904 Jackson County, Missouri Plat Map Book. Includes the cities and towns of Kansas City, Westport, Independence, Blue Springs, Lees Summit, Oak Grove, Raytown, Grain Valley, Grandview, Sibley, Buckner, Lone Jack, Martin City, and many more. An important resource for the study of the history (including the Civil War) and genealogy of Jackson County, Missouri. An informative and historical overview of Jackson County, Missouri including three separate books on one CD which include 6 historical maps (1851, 1899, 1902, 1904, 1913, 1920’s and 1929) showing the locations of 54 Jackson County, Missouri settlements; plus the 1904 Plat Map Book of Jackson County, Missouri; plus TWO different history books on one CD of Jackson County: the full 1881 History of Jackson County, Missouri book plus the full 1920 History of Jackson County, Missouri with a total of more than 1350 Jackson County, Missouri family biographies. F. A map from the 1920’s which includes details of where various tourist sites and service stations were located. Section Two of four, ALL on one CD: Jackson County, Missouri 1904 Plat Map Book This 50 page plat map book is in full color and at the original large format size. These maps show not only each of the cities and towns in Jackson County in 1904 but also each of the rural townships. Those who owned farm acreage in rural area are shown by name which makes it possible to pinpoint the location of where an individual family actually lived in 1904. This plat map book is a rare and valuable resource for genealogy and historical research in Jackson County, Missouri. Section Three of four, ALL on one CD: The complete 1881 History of Jackson County, Missouri This detailed (1008 pages in all) book published by the Union Historical Company in 1881 has an incredible amount of information about Jackson County, Missouri from its earliest settlement up to 1881. This is an exact photo replica of all the pages pertaining to Jackson County, Missouri including all of the historical and biographical information. Included are a total of more than 915 different Jackson County, Missouri family biographies. Section four of four, all on one CD: The complete 1920 History of Jackson County, Missouri This detailed (936 pages in all) book by W. Z. Hickman and published by the Historical Publishing Company in 1920 has a considerable amount of additional information about Jackson County, Missouri from its earliest settlement up to 1920. This is an exact photo replica of all the pages pertaining to Jackson County, Missouri including all of the historical and biographical information. Included are a total of more than 452 different Jackson County, Missouri family biographies. Each of the four sections on this CD is in Adobe Acrobat pdf format and require the free Acrobat Reader program to view. You probably already have this program on your computer but if not, a free copy of the program is included on the CD. Each of the books on CD is designed to look just like a regular book and is bookmarked to move easily and quickly from one section another. This CD was designed by, and is available exclusively from Hearthstone Legacy Publications. The cost for this CD containing all four sections described above is only $9.95 plus shipping, or only $6.95 as a digital download. A large amount of information for very little cost! 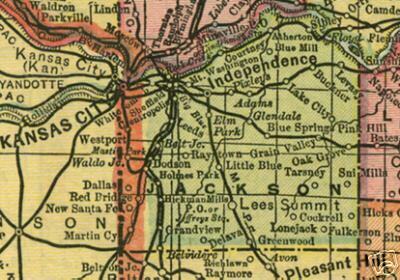 A truly fascinating view of Jackson County, Missouri from its first settlement to 1920. Includes considerable information concerning the Civil War period in and around Jackson County, Missouri. Since we offer many different county history and genealogy CDs, please be sure to specify that you wish to order the Jackson County, Missouri History, Genealogy and Maps CD. If ordering more than one CD, the shipping cost is $1.95 for the first CD plus only 25 cents shipping for each additional CD purchased.